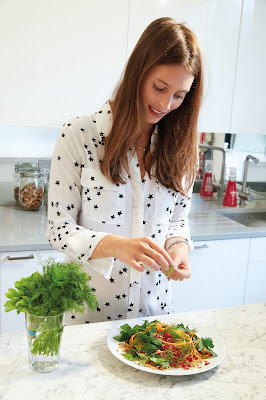 Today I'm sharing a recipe and giveaway from the #eatcleanmethod collaboration between Method and Deliciously Ella. 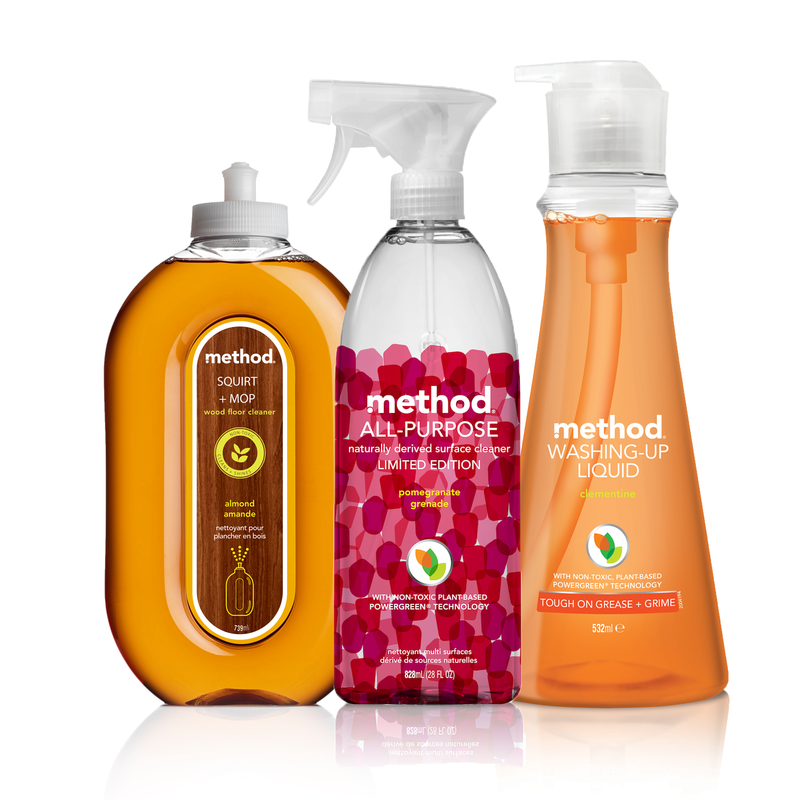 Method is a pioneer of planet-friendly and design-driven home, laundry and hand wash products formulated with naturally derived, biodegradable ingredients. Ella Woodward is the UK’s leading food blogger with a passion for clean, natural eating and living. Inspired by the fresh ingredients - pomegranate, almond and clementine - in method’s natural cleaning products, Ella created three new vibrant and tasty recipes. 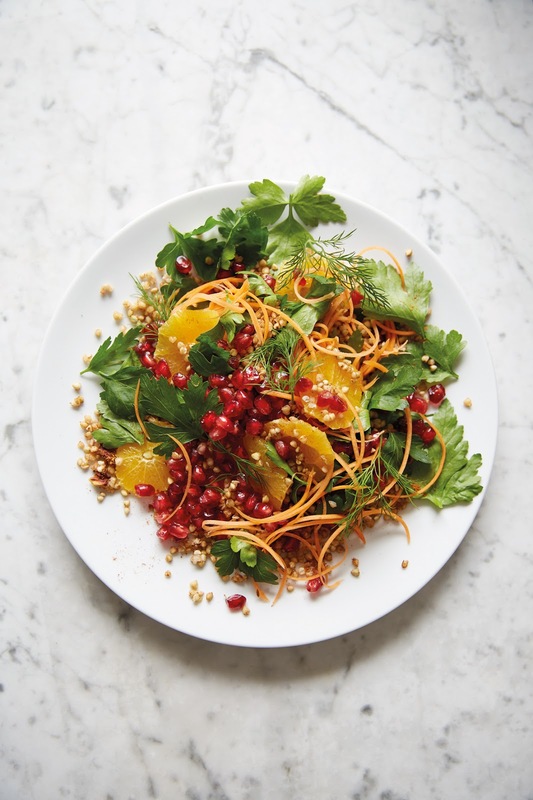 I'm sharing the main course which is a visually stunning salad with an amazing mix of orange, pomegranate, carrot and herbs tossed with buckwheat and spices. one of the things we love about this recipe is the colours - the reds and oranges really pop. bursting with flavours + textures your tastebuds will love it. 1. in a saucepan, cover your buckwheat with the water, bring to the boil and simmer for about 5 – 8 minutes, until most of the water is absorbed. drain the buckwheat through a sieve and rinse with cold water. drain again and then put into a bowl, mix in the ras el hanout, oil + seasoning. 2. while your buckwheat is cooking, peel your carrots and then using a julienne peeler, shred the carrots into thin strips and mix into your buckwheat. next cut the skin + pith from your oranges, then cut them into thin circles and mix into your buckwheat salad, letting the flavours all meld together. 3. pick the leaves from your parsley and chuck onto a serving platter, then mix through with the buckwheat. throw on your dill, mint + pomegranate seeds and give another mix, then serve. nice served along side roasted cauliflower + carrots with cumin. method thinks people just don’t pay enough attention to pomegranates. that’s why they’ve devoted an entire limited edition collection to this bright, ripe fruit, now this colourful superfood takes centre stage in Ella's fresh + fruity salad. 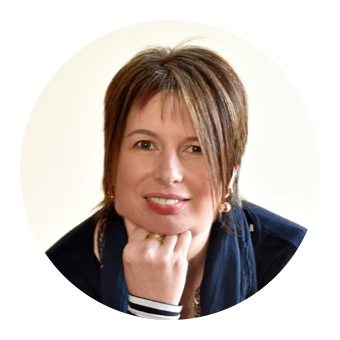 Method have provided a prize bundle comprising of the items that have inspired the recipes as a giveaway for readers of Foodie Quine. This includes a method branded EarthPositive tote bag, limited edition pomegranate multi-surface cleaner, clementine washing-up liquid, almond wood floor cleaner and gel handwash. Prize value is £25.49. Entry is via the Rafflecopter widget below. To enter, let me know in a comment "Which is your favourite scent from the Method range?" For additional bonus entries you can follow me or Method on Twitter, Tweet about the Giveaway, follow me on Instagram or like me on Facebook. Giveaway ends 9th March 2016 12:00am. Good Luck! Disclosure - This is a sponsored post for Method. All views expressed are my own. Recipe and images courtesy of Method. my favourite scent is clementine. Clementine as I like citrus smells, they are good at waking you up. Clementine, I just love any citrus scent and this one is so refreshing. 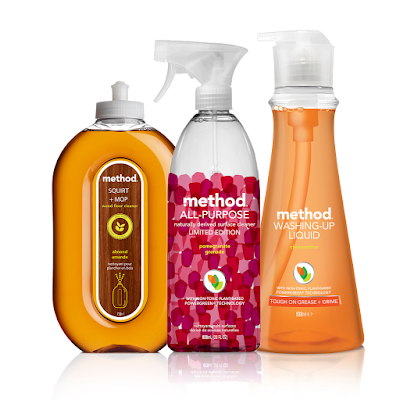 Such a hard decision, all the Method scents are lovely... but I especially love the French Lavender multi-surface spray & the almond scent of the wood floor cleaner! The Almond Wood floor cleaner is divine! I love the pomegranate smell. I love pomegranate- such an unusual smell for a cleaning product- everything's normally lemon! Pink Grapefruit is my favourite Method scent. My favourite is Pink Grapefruit..
Clementine or Pink Grapefruit - love anything with citrus! Their lemon mint, it's smells amazing! I am a loyal user of their lavender all purpose cleaner. It makes my worktops smell lovely. I love the almond floor cleaner. Smells good enough to eat. What a gorgeous salad Claire, love it! What a beautiful salad! I love adding pomegranate to salads, they add such a nice texture. Cucumber, it smells so fresh! The wooden floor cleanser scent is amazing - almondy! I've never tried it, but I like the idea of pomegranate. I love the clementine scent. I love grapefruit but I'd love to try the pomegranate. Sweet Citrus is my favourite scent from the range. I love the French lavender. It's the spray I always tend to get. Pink grapefruit but I'd like to smell the pomegranate one. I haven't tried them but I suspect that Clementine would be. I love the clementine scent! French lavender such a gorgeous scent. I love the smell of lavender so would choose French Lavender. French Lavender, it's calming, you can daydream away whislt cleaning pretend your'e somewhere else! The clementine sounds zingy and fresh. Love the Almond floor cleaner smell. my fav! Using the Juicy Pear handwash at the moment -divine! I love the Waterfall scent. I use the hand wash in my kitchen!